Charleene Closshey has been on a red hot creative streak since the spring of 2018. The cinematic release of the film she produced and starred in, No Postage Necessary during the summer of 2018 was followed by the release of the soundtrack for the album in October of 2018. Her new orchestral arrangement for the song “I Heard the Bells On Christmas Day,” peaked at # 24 on the AC charts and the Holiday charts in America. The Christmas song is a precursor for the full length Christmas album, which will be released in time for the 2019 Christmas season and it is produced by six time Grammy Award winning producer / sound engineer Brent Mayer. If your head is not spinning by now Closshey is also releasing her album Only Love Remains and as we write this we are getting close to the date for the release of the first single from the album. Charleene Closshey’s short film Perception did well on the festival tour and she received numerous awards for the music she composed for Perception. We are out of breath after that whirlwind tour of the past year of Charleene Closshey’s career and you probably are as well, so let’s turn out attention to our recent conversation with this multi-talented and creatively brilliant native Floridian. Even though No Postage Necessary was in theaters during the summer of 2018, it can still be viewed through a variety of means, iTunes, Amazon and through the new media platform Vevue. Closshey says, “I produced the film with my business and life partner Jeremy Culver. He was the writer and director on this particular script. We opted to produce as well, because we are gluttons for punishment. It was a story we wanted to get out there in an efficient (way) and with a very quick turnaround. The concept came up in March. We had a first draft of a script by May 1st and we started shooting August first. That turnaround time for pre-production is unheard of. Because of that we knew there was a level of intensity and efficiency that needed to be built into the production process. That also informed the decision to film in the Tampa area. Knowing what we had on the ground to work with locally allowed us to more effectively and efficiently build out the infrastructure that we needed to support ourselves fiscally, as well as creatively. We brought in people from all over the world to be a part of the team. If anything was to go wrong it was easy to say hey mom can you pick up the phone and help us to call in a few favors here and there. Fortunately, nothing did go wrong. If you go into a community that doesn’t know you, there is a little more of a relationship development time and we didn’t have that (time). In Tampa the relationships were already in place. The community was incredibly supportive of the film, so we were confident that the producing wouldn’t affect the creative side. That wouldn’t be the case for every script, but for this one it was. It was a very interesting experience and it was very intense. It is not something I jump up and do all of the time. I am a kid of two entrepreneurs, so I know what it is like to go out and find creative synergies that are good for everybody. I enjoy that and I enjoy connecting with others, while finding positive solutions. That is really what a producer gets to do from inception all of the way to completion. The film made its debut in the beautiful historic Tampa theater and people came in from Los Angeles and London. All of the people who showed up on set to be extras didn’t know what it was like to be on a set and they didn’t know what it is like to have a twelve or fourteen hour day when you sit in a room. We were filming in August in Florida and it was 103 degrees outside and it was one hundred percent humidity and they were walking up and down the street time and time again. It was a once in a lifetime experience for them. Our first screening was here in Tampa, before we took it to Los Angeles and it was a lot of fun. Charleene Closshey provided some interesting insights when we asked her what made her the perfect person to play the character Josie in No Postage Necessary. “Is there ever any one perfect person for anything? Is there only one perfect Macbeth? Is there only one perfect Cleopatra? Is there only one perfect, fill in the blank. I think one of the most exciting things about art is the ability to have completely different perspectives about it. Every actor has a different perspective and takes on a particular character. There are probably many other women who would create fantastic versions of Josie, but it just happened in this instance that it was something for me. As for why and how George Blagden was cast to play opposite Closshey as Sam, she says, “George is great. Jeremy worked with Sharon Howard-Field our casting director, who is London and Los Angeles based. She has done a lot of fun pieces like Grumpy Old Men (Editor’s Note: Sharon Howard-Field has a plethora of films to her credit, including no less than ten that are either being released in 2019 or are in various stages of production.) To get through to Jeremy you had to impress Sharon and George absolutely did. There were multiple other actors, most of whom were U.K. based. You can find great actors anywhere, but there was something about the U.K. training and perspective that I think really helped bring the subtle aspects of the Sam character to life. When you watch the film for the first fifteen minutes you probably don’t like Sam very much. How do you have a hero that the audience doesn’t like? George found the places of goodness in Sam and he allowed us as the audience to see them. It took very delicate handling and balance to be able to create that and he did. Josie is a single mother and Charleene is not a mother. Josie is a widow and Charleene is not, so how did Charleene Closshey prepare for becoming Josie in the movie? “Sympathy and empathy are two very profound emotions that we can experience. I don’t think we need to have someone else’s specific experiences in order to have an understanding of and compassion for them. We never really could, even if we both had the same experiences. Even if I was a widow my experience would be a very different experience from what Josie had. Understanding this (provides) great freedom for me to explore unencumbered the life this person would have experienced outside of my own construct. If anything I think it was easier, because I didn’t have my own (stuff) to get in the way of her emotions and her expressions. I don’t think that is the only way to create a character. I think when you share similar experiences, for instance we are both singers, so that was a different kind of color and understanding to play with. When you share the experience it will color the character a little bit differently and each character will be created a little bit differently. We may not have the same experiences, but we have all had elements of loss. We all know what it is to grieve for someone or something. There are a lot of different kinds of death that we experience in life. Whether or not it is the same specific (type) of death, we all get it. It is an emotion, color and a vibration that can be tapped into and specificity matters less than the purity of the actual emotion,” she says. 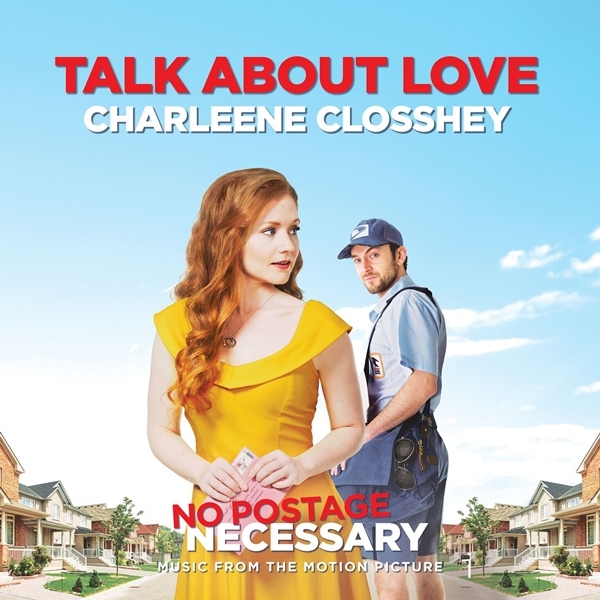 Closshey describes No Postage Necessary as, “a romantic comedy and two lost souls are trying to rediscover their voices. Charleene Closshey also released the short film Perception in 2018. “It was really well received. I won multiple awards for the music on it. I worked with a dear friend that I knew from twenty years ago. He came to me with a vision of a short film. It had a great festival stint. It is grounded in magical realism,” she says. It is difficult to imagine anyone not being positively affected after conversing with Charleene Closshey, as she enthusiastically talks about her creative endeavors and even life in general. “We have a big year ahead of us. I am releasing two albums this year. In October 2018 we released the soundtrack for No Postage Necessary. We combined the live tracks with the film score. That was a fun little album. This past Christmas I released my first radio single, “I Heard the Bells On Christmas Day,” and I was overwhelmed and overjoyed. It finished number thirty-five on the 2018 holiday charts. On Christmas Day we were number twenty-four and number twenty-three was Lady Gaga. It was also number twenty-four on the media based AC charts. That was a special experience. “I Heard the Bells On Christmas Day,” is a teaser for the Christmas album that will be coming out this November (2019). Christmas is my favorite time of the year. I love the magic of the season and the goodness that seems to float in the air no matter where you go. The holidays have always held a special place in my heart. Before that we are releasing a full album, Only Love Remains (now available) that is produced by Brent Mayer is a six time Grammy winner. You may recognize his name, as he is the gentleman who discovered The Judds. He has worked with Elvis, he had a record company back in the day with Bobby Darin and he engineered Ike and Tina’s Proud Mary: The Best of Ike & Tina Turner. He also engineered the The Age of Aquarius album by the 5 th Dimension. He has quite the background. It has been such a joy and pleasure to work with him,” Closshey says. Let’s back up Charleene, because you had a unique experience working on your Christmas album. “I wrote an original composition of “Ave Maria,” and it is for a soprano soloist and a boys choir. I was working with Four For Music and I told them I needed a boys choir they said great, we have the perfect one. I said fantastic. As it turned out it was the National Boys Choir of Bulgaria. One of the gentlemen from Four For Music is one of the top authorities in Bulgaria of Bulgarian sacred music. His son is in that particular boys choir. They came in and recorded it and I thought wow this is great. A few days after the session I received an email from the session conductor saying that she really liked that piece and she asked permission to include it in their Christmas concert that they perform on Christmas day in the Bulgarian capital. I thought about it for a half a second and I said yeah (light laughter, as in do I really have to think about this twice?). Hence the trip to Bulgaria (in the fall of 2018) and we filmed a music video with the boys choir (singing) that song. The film is in editing right now and it looks stunning. I am so excited about it. We were able to enjoy and experience the concert. It was the first time that I had heard that composition live. It was a magical and surreal experience,” she says. Closshey explains how she first became connected with Four For Music and eventually with the Bulgarian music scene. “In 2017 I had a track that we were working on and I told my producer this needs full orchestration and he said oh we can do strings here in Nashville and I said, no, no a full orchestra. A dear friend of mine several years prior had turned me on to a couple of different organizations in eastern Europe that they contract with and he would Skype in and conduct his own live sessions in a studio in Los Angeles that he was recording. I thought this is brilliant. For a lot of projects when you don’t want to sacrifice quality, but you have limited resources, you have to find ways to be creative. There is only so much programming that you can do. Programming is great and I have done my share of programming and especially on projects that didn’t have the budget to facilitate a live orchestra or the breadth and depth of session players that you would typically get on major motion pictures. They still want that sound, so you have to figure out ways (to make that happen). When we were considering that track in 2017, I started researching and I found this wonderful group out of Sofia the capital of Bulgaria. I started working with them and I loved them. They are brilliant and the musicians are topnotch. They really take care of their players. I’m a Capricorn, so I research extensively and I take copious notes and I look at things from every possible angle. I analyze the situation, but once I pull the trigger I pull it pretty hard. While I was going through the research I narrowed it down to two different organizations and the thing that sold me on Four For Music was a behind the scenes video of one of the sessions they did. It showed a quick (clip) of a ping pong table that a bunch of their players were gathered around and at which they were playing in between sessions. As a violinist and former session player that went a really long way, because it showed me how much they really care about their people. It is not just about the commerce, it really is connected to the people who are making the craft and the artistry that goes into everything that they do. I worked with them on several different projects last year and in fact one of the projects that we worked on was the Christmas album that I recorded last August and September. I have also continued to work extensively with the choir and orchestra out of Bulgaria, because it is considerably more cost effective for me to get the same quality that I would state side with this particular orchestra and group. As an independent artist I don’t have $100,000 to throw at a track. Charleene Closshey grew up in Plant City, Florida, the winter strawberry capital of the world, so she proudly tells this writer. She attended a performing arts high school in Lakeland, about thirty minutes away and she studied violin performance. As you already have sensed to describe Charleene Closshey as being passionate and driven would be an understatement and she appears to have inherited those qualities from her parents. “I was surrounded by people who instilled and demonstrated the importance of going after what it is that you are passionate about and what brings you joy. I am incredibly proud of both of my parents. I pretty well came out of the womb ready to go. My mom has a very strong personality and she is very much a type A and especially at that time. She was determined and industrious. Her story is so inspirational. She was raised on a farm with a dirt floor. Her parents didn’t want her to go to college, but she put herself through college with multiple jobs. She took her younger brother to school. She was one of three women in the business department in the sixties when women were not welcome in that field. She is really inspiring. Later on she went back (to school) in her sixties and she got her doctorate,” she tells us. We might accurately say that Charleene Closshey’s career began when she was two years old. “When I was three years old we were going to lunch and it was a Sunday afternoon after church. I was dressed in my pretty blue dress. In the mall where we were having lunch there was a sign that said free baby pictures and my parents thought hey, what the heck. You go and sign a waiver and you do your thing. A few weeks later my mom got a letter that said congratulations you daughter has been chosen by Northern Bathroom Tissue. It is interesting how the good things, the funny things, the little winks and the universal winks that can happen just by being in the right place at the right time. That is all it was. That picture was (used) for twenty years. I still have the picture to prove it. They had taken the photo and turned it into a hand drawn illustration. You can still look it up and find it online. It’s not something that you walk around and say (her voice deepens) I’m the baby on Northern Bathroom Tissue,” she recalls. Closshey also began to play the piano at age two and yes she had a piano teacher at age two. “What do you do with a two year old? When they sat me in front of a piano there was a lot that they could do. My piano teacher taught me how to read music, before I could actually read words. Music has always been a huge part of my life. Songs and hearing portions of songs trigger something in the mind. For me it has been that way since day one. I hear colors and I look at patterns and fabrics and I hear the vibration of it. It is how I interact with the world too. For me everything is vibration based. If something feels right you do it. Because I think in sound, sometimes to cross the barrier and to think in words is a bit more challenging,” she says. Charleene Closshey’s musical journey had moments shared with Charlie Daniels as the performed in concert and dueled on their fiddles to “The Devil Went Down to Georgia.” She also shared the stage with Josh Groban, Mannheim Steamroller, Trans-Siberian Orchestra and Frank Sinatra, Jr.
As far as Closshey’s acting career goes, should we be surprised at all when she tells us, “I have been on stage since I was a baby. They would carry me out on stage for shows. These stages were in 10,000 seat auditoriums. I have always been accustomed to being in front of a lot of people. I think it is interesting what the universe brings us at different times and how the experience prepares us for the next step and the next step after that. For me acting is always something that I have done and not just acting on stage, but creating characters and creating a story greater than yourself and contributing to something greater than yourself. I have acted all of my life, mostly on stage. I did some screen stuff early on, but there really wasn’t a big outlet for it where I was growing up in Florida. The industry really isn’t here. That did not stop her though and in 2014 Closshey starred in An Evergreen Christmas with Naomi Judd and Robert Loggia, a film that was directed by Jeremy Culver and written by Jeremy and Morgen Culver. She wrote the score for the film, sang in it and as we already said she had the lead role. Has Charleene Closshey discovered that balance? One certainly gets the impression that she has. At a relatively young age, she has already accomplished so much and in so many different ways, it is easy to become excited about what the future holds for her. We have only given you a glimpse into Charleene Closshey’s life, but there is so much more to discover, so please check out her music and her films.